This mother Black Bear has a cub close by and she is always on alert to make sure that there is no danger as a mother bear is very protective over her young. Black bears usually run in the other direction when humans are nearby but if you happen to cross paths with a mother and her cubs, do not venture too close. 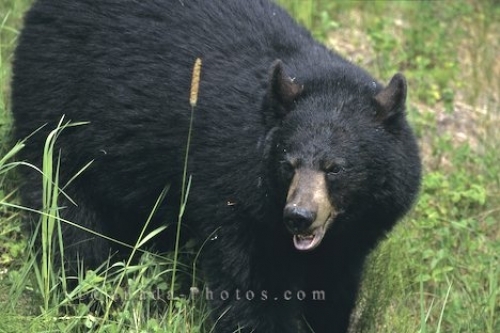 A Black Bear, Ontario, Canada, North America. Picture of a mother black bear keeping watch to make sure the area is safe for her cub in a lush green field in Ontario, Canada.